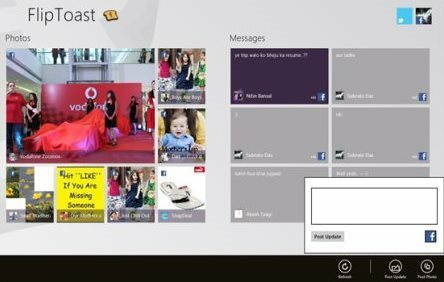 Here are 4 free Windows 8 social networking apps for those who do not want to miss even a single update from their friends. You can easily interact with bunch of people, anonymously. You can post tweets or statuses, comment on them, and do what you usually do in your social networking profiles. WNM Live is one of the most popular Windows 8 social networking apps that lets you not only connect to your friends, but also you can make new friendships or connections with people living nearby your area. You can easily view their profiles, interact with them live, send & receive test message, and more. Now, the interesting part is that you can hide your phone number, and other personal / private info while you are browsing through their profiles. You can look for a partner, living near you and sharing your interests towards life. Read more about WNM Live or simply download it from the Windows 8 Store now. Yet another popular Windows 8 social networking app, FlipToast, available under the ‘Social’ group of App Store, connects you with Twitter and Facebook at one time and keeps you online all the time. You can build and develop your online social life by interacting with your friends and family whenever they are available. The app does not allow you to miss even a single post or tweets from the. You can easily share photos, engage with tweets and posts by tweeting back, liking their statuses, making interactive comments, and the like. You can get more info about FlipToast or just head over to the App Store and install FlipToast now. 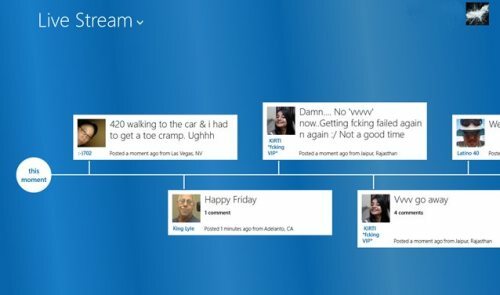 Rowi is basically a Twitter app for Windows 8 that works like the Twitter social networking site. This Windows 8 app lets you follow people, get followers, post tweets, retweet, and do everything you do on your Twitter account. Rowi has been designed, especially for Twitter beginners, it’s very simple and easy to use. There are columns for direct messages, mentions, home timeline, favorites, photos, and more. Get more info about Rowi or move to the Windows 8 Store and download Rowi from there, right now. 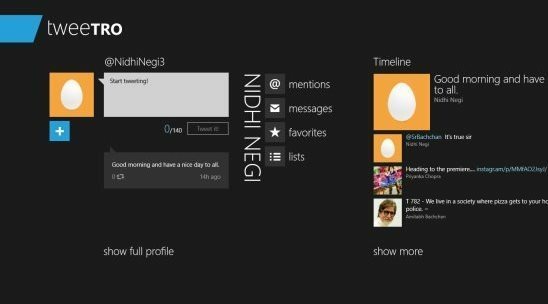 Ending my short post with this last but not the least Windows 8 social networking app, Tweetro. 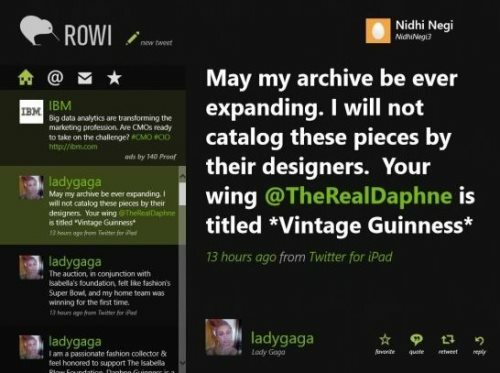 Again, it’s a Twitter app for Windows 8. You can post your tweets, comment on others’ statuses, photos, basically, access your Twitter account, right on your Windows 8 system (without touching the browser). You can read our entire post on Tweetro to get more info about it or you can just head over to the Store and download this Windows 8 social networking app now.